Believe it or not, spring is here! 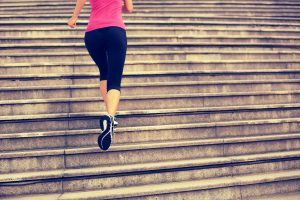 Klasinski Clinic encourages you to get out and to stay active as the weather starts to warm up. Going for a run in the sunshine while smelling that fresh spring air is one of the best feelings! But are you ready for a lengthy jog? The proper running attire can make all the difference in a comfortable and enjoyable exercise experience. Of course, the most important attire for jogging is your running shoes. Choosing the right pair of shoes can mean the difference between a good workout or aches and pains after a run. You want to be sure you have the support needed for your feet! There are many factors to finding your perfect running shoe, so how do you know which shoes are right for you? Know how you run! When it comes to finding the right shoe, it is important to know where your foot first comes into contact with the ground. Find a local expert or a store that specializes in running shoes. They will be able to watch you run onsite, identify your running pattern, and determine the shoe that is right for your foot. Identifying your running style can also help you avoid common injuries like shin splints, blisters, and plantar fasciitis, which are often caused from improper footwear. 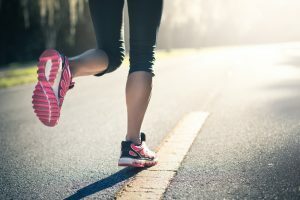 Stores that specialize in running shoes will typically have a treadmill onsite or they will even let you take shoes for a quick test run outside. Trying on a shoe is much different than running in it, so it is important to try them out first. Don’t just assume you know the right size shoe for your foot. Shoe sizes typically vary depending on the manufacturer and there are several other factors to take into consideration such as, the length, width, instep, heel, and flexibility of the shoe. Determining your shoe size is essential for a comfortable fit and will make running a much more enjoyable experience. When it comes down to comfort and having an enjoyable experience, having the right clothing is just as important as having the right shoe! When choosing clothing for a run, here are some factors to keep in mind. Avoid cotton apparel. Instead choose socks, shirts, pants, and shorts made of “technical” materials, which pull sweat and moisture away from your skin. They’re lightweight and they help you stay cooler in warm weather.If you run before sunrise or after sunset, it’s critical to wear gear that ensures that you can see and be seen. Make sure you wear reflective clothing and consider wearing a headlamp to help you see in the dark. Finally, find clothing that offers protection from the sun and has pockets for essential items that you may need to have access to during your runs. Once you find clothing that really works with your body as you run, exercising becomes a much more enjoyable experience! If you experience foot or ankle pain at any point during or after running, visit the Klasinski Clinic foot and ankle pain page to learn more.